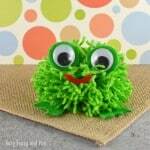 Have you ever made a pom pom using a book? 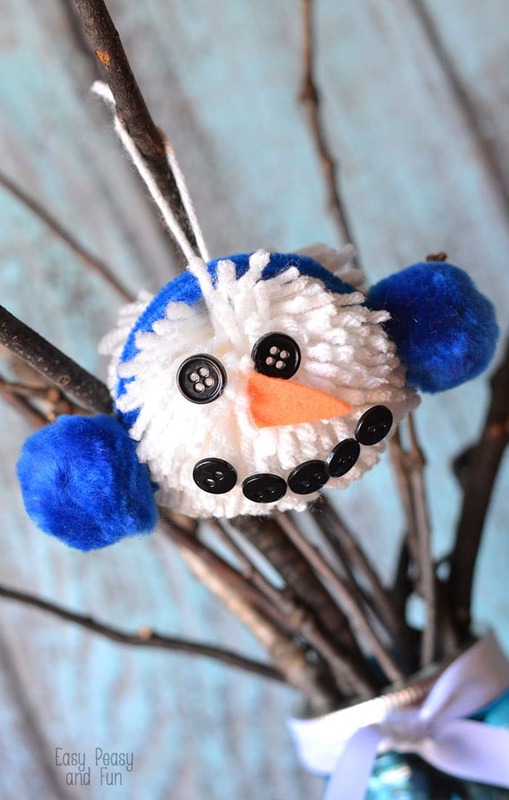 It’s fun and this is the method used to make this cute pom pom snowman ornament. Cut a longer piece of yarn, about 12″ and set aside. This is your tail. Take a hardcover book and wrap yarn around it. 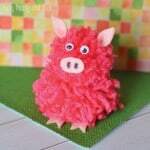 I usually start with about 100 wraps, depending on how big I want my pom pom. Trim the yarn. Slide the tail under the wrapped yarn on the book. Remove the yarn from the book by sliding off. The tail helps to keep the looped halves separate. Cut the pile of yarn in half and place one half on top of the other. Using your tail yarn, TIGHTLY tie the yarn in the center. Use a partner to press down on the center as you double knot it. DO NOT TRIM THE TAIL. Grabbing onto the tail, gather the pom pom in one hand and cup it as shown. Do not cut the tail. Wrap it in your palm and around your fingers if it begins to get in the way. Using scissors, trim your pom pom as desired, evening up the pieces, creating a tight style pom pom or a loose floppy one. 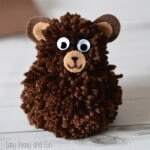 The tail string can be your hanging string, or, if you choose not to hang, trim the tail to the same length as the pom pom. White Yarn Pom Pom Was wrapped 100 times around a 6″ book. 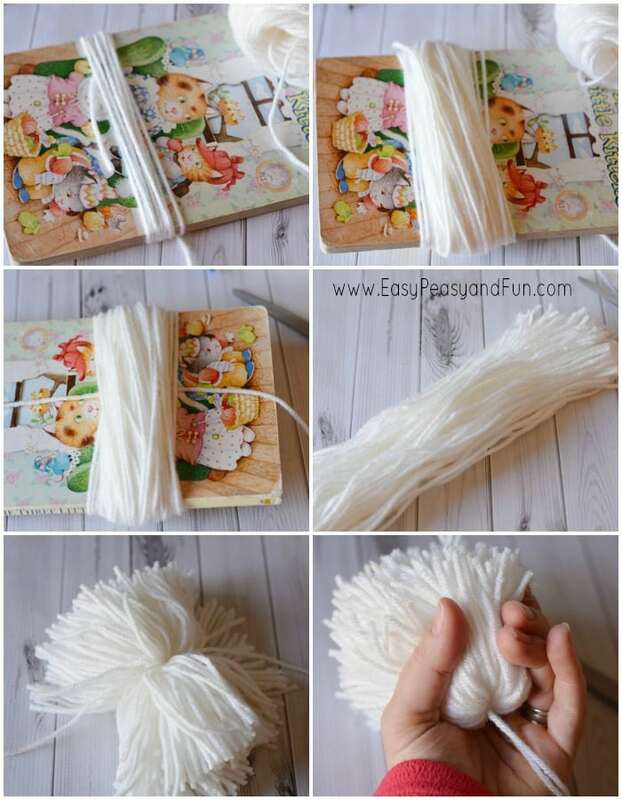 Using the Pom Pom instructions, create a white pom pom by wrapping white yarn around a book 100 times. Keep the tail long and use for hanging. 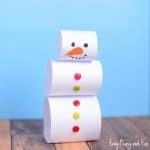 Fold two chenille sticks in half and hold them together with a piece of clear tape in the center. 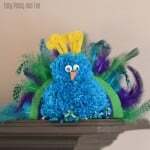 Bend them into a half circle and hot glue the blue pom poms onto each end. 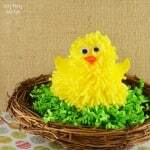 You may need to trim the chenille stems depending on the size of your pom pom. 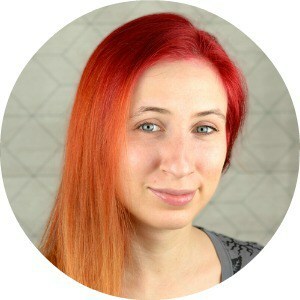 I cut about 1″ off the end of mine. 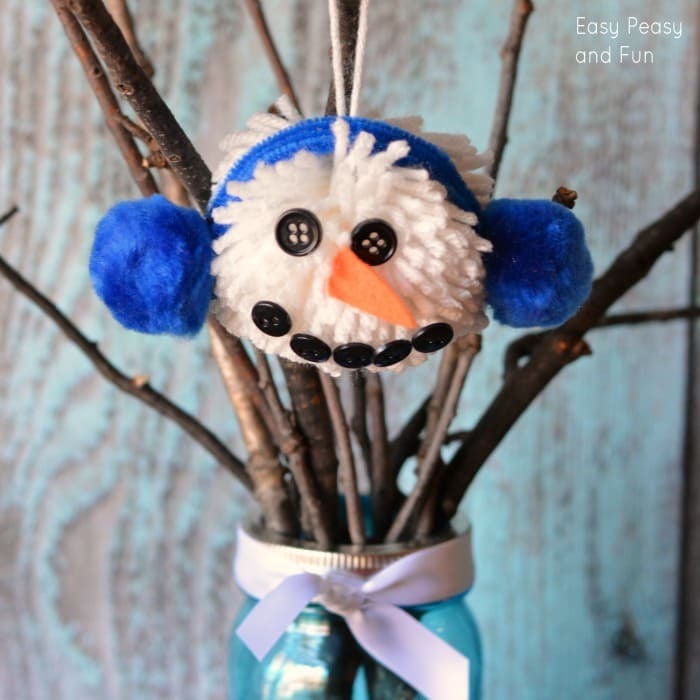 Glue blue ear muffs to white pom pom. Add 2 black buttons for eyes and hot glue. Cut a small triangle out of orange felt for a nose and glue onto your white pom pom. Mine is about 1.25″ long. Add five black buttons for a mouth with hot glue. Tie a simple slip knot in the tail yarn and hang!